Calle, my husband is a professional who is hardly ever home. When he is home, he ignores me and the children. He doesn’t want to interact with us and he doesn’t want us bothering him. There have been multiple incidents of physical abuse that resulted in trips to the hospital. But, because he is an esteemed professional, his family, friends, and colleagues don’t think there is anything wrong with him. I am tired of the neglect. I am angry. And the deceit is extremely galling. What should I do? Some men become physical because they don’t have any other way to deal with their wife’s provocations. So, the first thing is to check yourself…and your way of interacting with your husband…and make sure you are not provoking him. Remember that you and your husband are very different. So, do not try to make him do things in your way. Do not try to make him want what you want. Do not try to make what is important to you a crisis for him. When a wife lets her emotions drive her…when a wife lets whatever is bugging her take over her focus…when a wife zooms in on a thing…when a wife let’s negativity and negative energy take over her…such that she becomes a “firestorm” to her husband…and she turns their interactions into a “firestorm”…well soon enough, something bad IS going to happen. The only questions are what and when. Now, how do you check yourself? Well, if everyone who was important to you was shown a hidden video of you interacting with your husband…would you be proud of yourself? Would you be proud of how you interacted and related? Would you be proud of how you conducted and carried yourself? Or, would you be ashamed and embarrassed for people to see how you interacted and acted? Moreover, would observers of this hidden video be surprised and shocked that your husband reacted the way he did…and wonder what was wrong with him and why he reacted and responded the way he did? In other words, would it be obvious to all observers that there was no reason at all for your husband to respond, react, or behave in the way he did towards you? If you still aren’t sure, then perhaps a discretely hidden/placed video camera somewhere where you can record you and your husband’s interactions is the route to go. 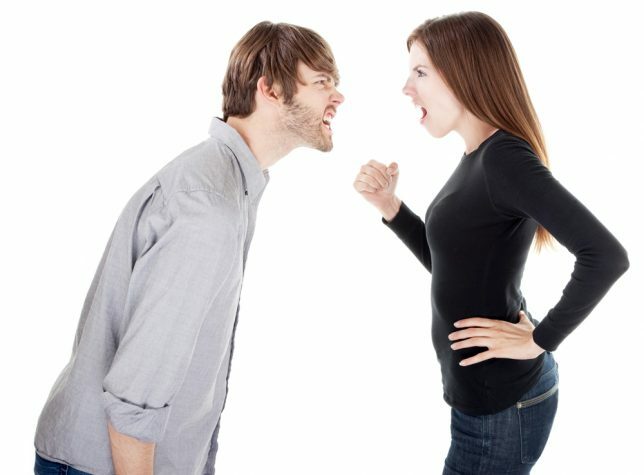 Each day, go back and watch the preceding day’s recordings…and watch what you are saying and doing…watch how you are interacting with your husband…and watch the reactions and responses that are building in your husband before he says and does anything…and LET yourself learn from what you observe. Who is your husband abusive with? Is he abusive towards just about everyone? If yes, then he is a mean bully and you should separate yourself and your children from him immediately…or as quietly and quickly as possible…divorce him and move on with your life…because such a man is unlikely to change relative to you. The only thing such a man will respect is superior power and strength…and it is unlikely that you have such power or strength. If your husband is abusive only at home towards you and/or your children…then is it because he is a weak coward who brings his outside resentments, frustrations, and anger home and takes them out on his family? If yes, then again, separate yourself and your children from your husband as quickly as possible…because the weakness and cowardice of such a man makes him very dangerous…and you are NOT going to ever fix, change, or help him. If your husband is abusive only at home…then is it because you are provoking him? Is it because you are causing him to feel strong bitterness, resentment, or frustration in relation to you…so much so that it invokes a strong reaction in him towards you and/or your children? In other words, is your husband’s abusiveness something that comes out for no OBSERVABLE reason? Or, if people were watching, would they be able to predict “fireworks” as a result of the interactions they are observing? Does the abuse truly stem from deep-rooted flaws within your husband…does the abuse truly have nothing to do with you…and you just happened to be the nearby person he reached out to abuse in response to his own internal issues? If yes, then the proper CHANGE is for you to gather up your children and permanently get away from him. On the other hand, if the abuse is always in response to you provoking your husband until you push him over the edge, then the CHANGE needs to happen within you. People naturally gravitate towards good, friendly, happy places. People are naturally attracted to and drawn to places that are warm and pleasant. On the flip side, people naturally avoid bad, unfriendly, unhappy places. People are naturally repelled from places that are cold, harsh, or hostile. And, most people have a choice as to where they spend the bulk of their time. So, if work is a hostile environment…but home is a pleasant environment…well, any normal person is going to minimize their time at work…and maximize their time at home. In contrast, if work is a pleasant environment…but home is a hostile environment…well as before, any normal person is going to maximize their time at work…and minimize their time at home. If he is a professional, then it is highly likely that he is spending his working hours with people who are NOT their best…which means he is already in a fairly negative environment…and after eight or more hours of that, any normal person is going to want to get out of that environment and go somewhere else that is more positive, pleasant, and enjoyable. But, if home is filled with even greater negativity, stress, bitterness, resentment, trouble, etc. then a normal husband is going to select the lesser of two evils and just stay at work…or he will find somewhere else to be besides work or home. Now, there ARE married guys who are nothing more than immature, irresponsible, self-centered, selfish little boys who still think of life in terms of their own entertainment, recreation, interests, and ease. But even with such guys, IF home is the most pleasant place to be, that is where their selfish interests will lead them to. So as before, what CHANGES can be made here to make home a more welcoming, pleasant, enjoyable place for your husband to be? There is no refuting a video. So, if you are convinced that you are in no way provoking your husband’s neglect or abuse…then plant a hidden video camera and capture the irrefutable TRUTH. At the very least, install a spy video app onto your phone…one where you can capture video even though your phone looks like it is turned off…one where you can discretely hit a hot-button combination to invisibly turn the video camera on your phone on when things start getting tense with your husband. By capturing reality on video, nobody can excuse or brush aside your husband’s abuse. And, you will have all the justification you need to separate yourself and your children from your husband. Moreover, when your husband’s family, friends, and colleagues want to criticize or condemn you for your actions, you can simply hand them a copy of your videos and tell them move along back to their own business. Bottom line, IF there are positive changes and improvements that YOU can make…that will invoke a different response in your husband towards you…then wisdom would be for you to make those changes immediately, emphatically, and permanently. On the other hand, IF your husband’s neglect and abusiveness has nothing to do with you…IF your husband’s behavior is evil no matter how sweet or good you strive to be…then again, remove yourself and your children from his life…doing whatever you have to do to protect yourself and your children…divorce him and move on to the next stage of your life. In short, be your best, most enjoyable, most pleasant, most desirable self…AND…respect, value, protect, and stand up for yourself.